Consumer Action and AT&T co-hosted a California Lifeline roundtable for community-based organizations in the greater Los Angeles Area. 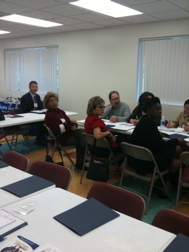 The purpose of the roundtable was to educate groups on the California Lifeline telephone program. On Tuesday, December 1st Consumer Action (CA) and AT&T co-hosted a Lifeline training for community-based organizations (CBOs) providing services to communities in the greater Los Angeles area. The training brought together 25 nonprofit agency staff, front line advocates, legal services representatives, case managers and educators to learn about the latest updates about California Lifeline telephone services. The new information is designed to assist organizations in providing accurate information to their clients and constituents on ways they can benefit and enroll in the Lifeline program. In an interactive discussion, an overwhelming majority of the workshop participants “strongly agreed” that the Lifeline information was extremely beneficial and will be helpful to their clients. The event began with a welcome from Mikael Wagner, Consumer Action’s Director of Outreach & Training and Karime Bradvica, AT&T Executive Director of External Affairs. Wagner gave a brief overview of the agenda and reviewed the training materials. Afterwards, Jeff Mondon, AT&T Director of Regulatory Affairs provided the audience with background information about the Lifeline Program. CA Outreach team members Nelson Santiago and Audrey Perrott kicked off the training with an engaging session highlighting Lifeline features, benefits, program eligibility, the enrollment/renewal process, and resources available. Following the lecture, a representative from the California Telephone Access Service conducted a presentation about the free telephone equipment available to CBO clients. Making sure that the consumer phones lines are answered in the various languages. Making sure that Lifeline information will include 3 additional languages (English, Spanish and Chinese). Concern about reaching retired individuals who are not receiving very much money. Ways to work with immigrants and refugees who are living in California but may or may not be documented or unable to work or make enough money to apply for Lifeline Telephone services. Concern about language barriers and steps that case managers should take to assist their clients. The audience became even more excited once the drawing began for the Lifeline iPod Shuffle. Perrott also explained the evaluation process to participants and provided each with a travel stipend. 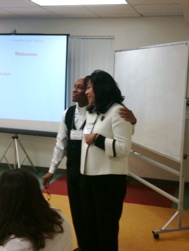 Participants thanked the Consumer Action team repeatedly for giving them valuable feedback and support.